Calorie-restrictive diets are showing promise to potentially treat an array of medical conditions. Scientists have investigated the effect of extremely low-calorie diets on a range of illnesses, from autoimmune diseases such as multiple sclerosis to asthma. Other researchers have evidence the diets may help to prevent diabetes and cardiovascular disease, and studies are under way to determine if they can extend survival in cancer patients and reduce side effects of chemotherapy. “Periodic fasting shows the most promise in getting rid of bad cells and making good ones for regeneration and can be applied to all kinds of diseases,” says Valter Longo, director of the Longevity Institute at University of Southern California, who has been investigating severe calorie restriction’s effect on multiple sclerosis. “Autoimmunity is one of the things where we’re going to see the most dramatic effects,” he says. Calorie restriction is most often associated with weight loss such as the popular 5:2 diet, which calls for eating sparely for two days and normally for five. Researchers say weight loss may be an added benefit to extremely low-calorie diets, which could add potential new treatment options for various conditions. In a new study, Dr. Longo and colleagues found severe calorie restriction in mice reduced symptoms of multiple sclerosis, a neurological disease, and eliminated symptoms altogether in 20% of the animals. There was also regeneration of myelin, a protective sheath surrounding nerve fibers in the brain and spine that are damaged in patients with MS. The mice ate a very low-calorie, low-protein diet for three days a week for three weeks. Dr. Longo refers to this as a “fasting-mimicking diet” because it induces the same positive changes in the body as prolonged, strict calorie restriction. 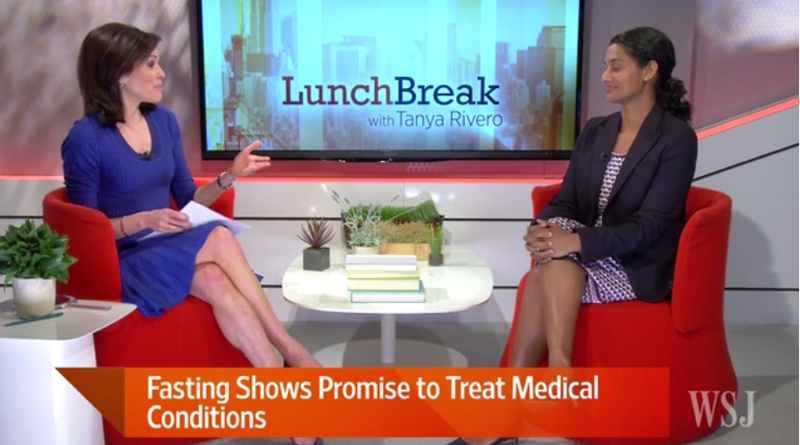 Dr. Longo also tested the diet with 48 human patients with MS, and found promising results. The patients were divided into three groups. One group ate 300 to 400 calories a day for one week, followed by six months of a Mediterranean diet. Another group ate six months of a ketogenic diet, a high-fat diet often used to help treat difficult epilepsy cases in children. And a third control group ate a normal diet similar to what they had been previously eating. Patients in the calorie-restrictive/Mediterranean-diet group reported the most improvements in their health and quality of life. An adult woman needs 1,600 to 2,400 total calories a day, depending on physical activity, age, height and weight, according to the U.S. Department of Agriculture’s dietary guidelines. For men the calorie range is from 2,000 to 3,000 a day. Dr. Longo’s study was published in June in the journal Cell Reports. His lab is currently setting up clinical trials for other autoimmune diseases, including Crohn’s disease and Type 1 diabetes. A Los-Angeles based company founded by Dr. Longo, called L-Nutra, recently started selling a commercial version of a five-day fasting-mimicking diet with more calories allowed a day called ProLon. Dr. Longo is chairman of the L-Nutra board but says he receives no financial benefit from the company as all shares will be donated to a nonprofit foundation he created to do research on calorie-restrictive diets. Scientists have found diets that severely restrict calories periodically can help treat various conditions. Autoimmune diseases: Extremely low-calorie diets may reduce symptoms in multiple sclerosis and other autoimmune diseases by killing autoimmune T cells and regenerating new cells. Cancer: Animal studies have found periodic calorie restriction can help protect against the side effects of chemotherapy and make it more effective at killing cancer cells. Ongoing clinical trials are looking at whether those findings hold up in humans. Metabolic syndrome: Research suggests periodic calorie restriction may lower the risk of developing diabetes and cardiovascular disease. The regimen results in more belly-fat loss, improved regulation of blood sugar and reduced inflammation. It also lowers blood pressure and reduces the resting heart rate, which improves the ability of the heart to deal with stress. Asthma and rheumatoid arthritis: Studies have found periodic calorie restriction can improve asthma symptoms and reduce inflammation in the airways. There is also evidence it reduces pain and joint swelling in patients with rheumatoid arthritis. Sources: Valter Longo, University of Southern California; Mark Mattson, National Institute on Aging. Many people would have difficulty consuming as few as 400 few calories a day for a week, so researchers are testing variations. Dr. Longo is working on another study with MS patients eating a daily diet of 800 to 1,100 calories and with more cycles to the diet. He has tested the fasting-mimicking diet in previous research that found it extended lifespan and improved metabolism and cognitive function in mice, and reduced risk factors for diabetes, cardiovascular disease, cancer and overall aging in humans. Ellen Mowry, associate professor of neurology and epidemiology at Johns Hopkins University, in Baltimore, says Dr. Longo’s mouse data in the MS study are particularly interesting because the researchers were able to evaluate the effect of the diet on the animals’ spinal-cord tissue. She said the data in the human portion of the study is harder to interpret as it is difficult to determine if the results are related to the calorie restriction or differences in diets. Dr. Mowry also is researching calorie restriction’s effect on MS, but doesn’t work with Dr. Longo. Experts say calorie-restrictive diets should be avoided in young children, pregnant women and the frail elderly. Typical side effects include a minor headache on day two or three of calorie restriction. Strenuous exercise should be avoided and calorie-restrictive diets that consist of multiple days should be followed by a day of light feeding before a normal diet is resumed. Another area of investigation is calorie-restriction’s effect on asthma. “Previous studies have shown intermittent fasting seemed to prevent asthma exacerbations but I think it’s a pretty tough lifestyle thing to do,” says Michael Sack, chief of the cardiovascular and pulmonary branch of the National Heart, Lung and Blood Institute. As a result research groups are also exploring interventions that have similar effects but are easier to maintain, he says, such as Dr. Longo’s fasting-mimicking diet. Dr. Sack and other research groups are looking at a vitamin B analog that may also mimic the fasting effect in the body, he says. Mark Mattson, a senior investigator and chief of the neuroscience laboratory at the National Institute on Aging, is co-creator of the 5:2 diet. He says he has tested this and similar calorie-restrictive diets on mice and in humans and found it extends longevity in mice and improves a number of health markers in humans. There is research suggesting that calorie restriction two days a week may lower the risk of developing diabetes and cardiovascular disease, Dr. Mattson says. Such a diet also lowers blood pressure and reduces resting heart rate, which improves the ability of the heart to deal with stress, he says. “There are a number of ways in which fasting seems to benefit different organ systems,” he says. “The bottom line is, intermittent fasting increases the resistance of cells in the brain and body to stress.” Dr. Mattson is currently doing a study looking at the effects of calorie restriction in obese, elderly people at risk for Alzheimer’s disease to see if it will improve their cognitive function. Ongoing research also involves cancer patients. Dr. Longo is conducting one of a series of clinical trials to see if lower-calorie diets can help make chemotherapy more effective at killing cancer cells. “It’s all about the body fixing itself,” he says. Pamela Peeke, an assistant clinical professor of medicine at the University of Maryland who has a private practice in nutrition and metabolism, says she began recommending ProLon to patients after trying it herself and finding she had more energy.